What is a knit soaker? One of my diaper obsessions centered around knitting soakers. While I was mainly a prefolds and wraps diaper-er, sometimes a breathable cover is just irresistible, especially in warm weather. 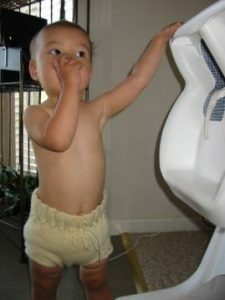 There’s something very appealing about watching your little munchkin walking or crawling around in just a t-shirt and diaper with a cute, breathable cover. They look adorable, and their tushie stays nice and cool. I’m not sure how soakers got their name. First of all, they shouldn’t be confused with the soakers that are laid or sewn into diapers. Those provide the absorbency to soak up urine and are made of cotton or hemp. 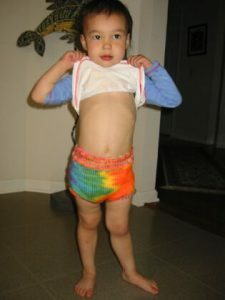 The knit soakers I’m talking about are used as diaper covers. They are usually made of wool, which can soak up some liquid without wicking it onto outer layers of clothing, so that’s probably where the name comes from. One of my favorite yarns for knit soakers is Lion Brand’s Fisherman’s wool, which you can get at Joann Fabrics (not all Joanns though — mostly just at the larger Joann etc. stores). It comes in an eight-ounce skein which is enough for about three soakers. 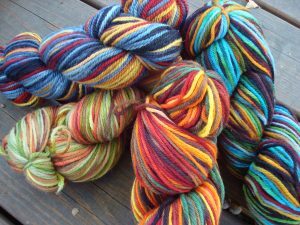 If you don’t have the interest in dyeing yarn, you can still use beautifully hand-dyed yarns from independent sellers like Mosaic Moon or The Knitting Addict. Finally, if you or your little one have a wool sensitivity, you can also give acrylic yarn a try. Acrylic works as a soaker because it is essentially plastic and doesn’t absorb water. 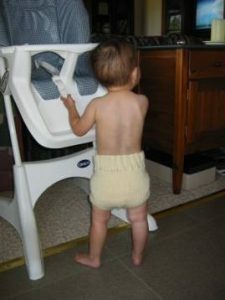 So as long as the knit is tight enough to prevent contact of the diaper and the outer clothing, it performs reasonably well as a water-resistant barrier. The advantages of acrylic are that it’s machine washable and dryable, doesn’t need lanolizing, is super-soft, and since the yarn is more slippery, makes for a stretchier fabric. However, it doesn’t have the anti-bacterial properties of wool, so it needs to be washed more often, and I think it gets pillier in the wash over time, but probably hand washing would alleviate some of that. 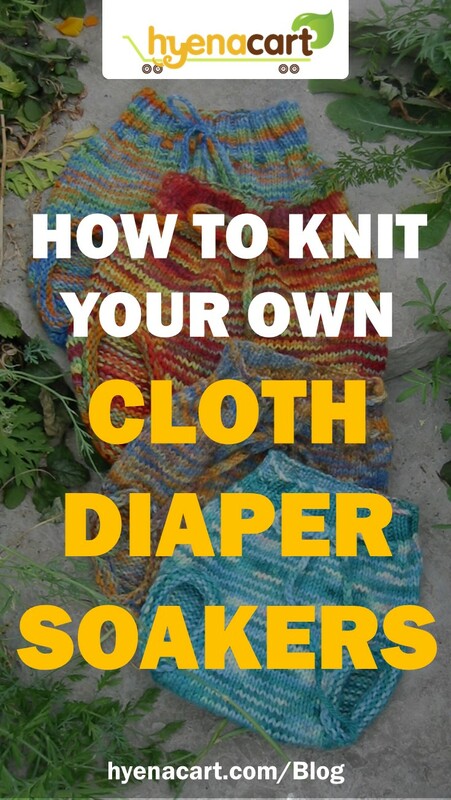 If you’re not a knitter, you can still make soakers using old wool sweaters. Pick up a 100% wool sweater at Goodwill, then wash it in hot water and dry it on high in the dryer. This will felt the wool up and make it water-resistant. Then follow the instructions at the bottom of this page, or the bottom of this one.